4K ULTRA HD Experience: Support H.265 4K video decoding, while supports 2K and 1080P, meets your multiple demands. Mirror Full HD video, 4K, and audio to TV or Projector from a mobile device. 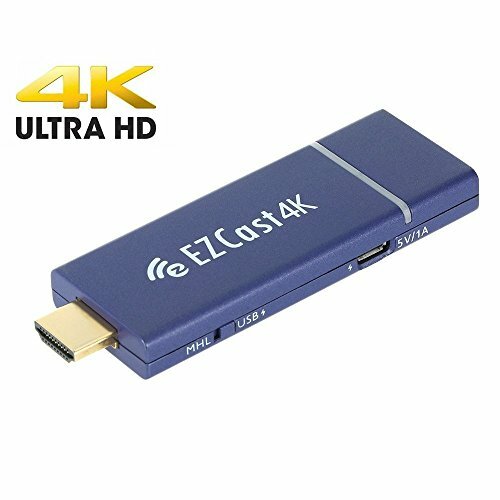 Excellent Performance: Sports a dual-core processor, and 2.4G/5G dual band WiFi with 802.11ac supported, enables larger bandwidth and wide applications, higher speed in transmission, also, EZCast will keep updating the EZCast dongle online all the time. Dual Display Interfaces of HDMI/MHL: Press the button on the EZCast dongle to switch between HDMI or MHL mode freely. Get dual output interfaces on one dongle, get better user experience. Personized DIY Function: Autoplay, it is a fantastic function that let you automatically play your channel video without phone involvement. Sign in EZCast account and Power-On autoplay, you can create your own personal Channel and be your own VJ. Wide Compatibility: Supports Miracast, Airplay, EZCast and DLNA. Cross-platform mirroring on Windows, Mac, Android, iOS, Windows Phone and Chrome devices. Easily stream video/audio/subtitle to big screen with wide coverage of formats.